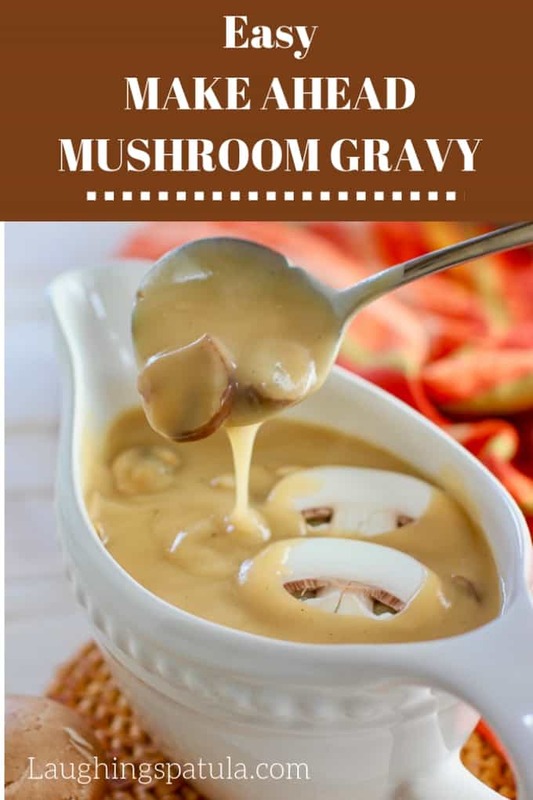 Easy Make Ahead Mushroom Gravy! – You can never have enough gravy! Wouldn’t that make a nice tattoo? You can use turkey drippings or just boxed broth with this recipe. The trick is to use the proper portions of butter and flour to broth to get the perfect gravy consistency! Make ahead recipes on Thanksgiving day are a gift. It is truly one of the hardest, if not THE hardest meals to make. Mostly because everything has to be hot and on the table at the same time. Make this gravy up to 3 days in advance to lighten your cooking load. 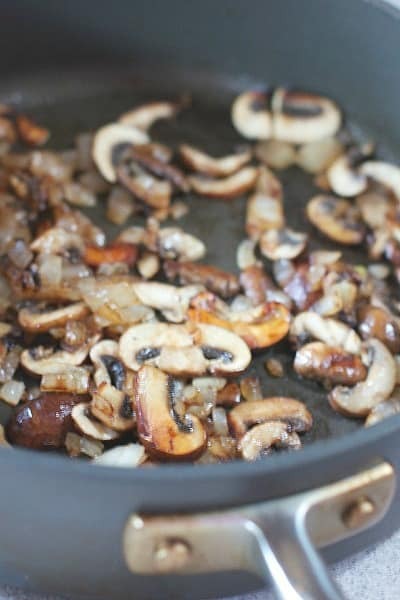 By simply browning the onions and mushrooms for a few minutes in a skillet, the flavor goes from zero to 60. TIP: Avoid adding salt to your mushrooms until they are as brown as you want them. Salt makes it harder for them to reach their full browning capacity :). This makes about 4 1/2 cups which would be enough for about 10 regular people or 8 gravy lovers! Once your mushrooms are caramelized and your onions and garlic are tender, set them aside while you make your roux. Melt your butter, add your flour, cook for about 4-5 minutes until it reaches a light brown color. 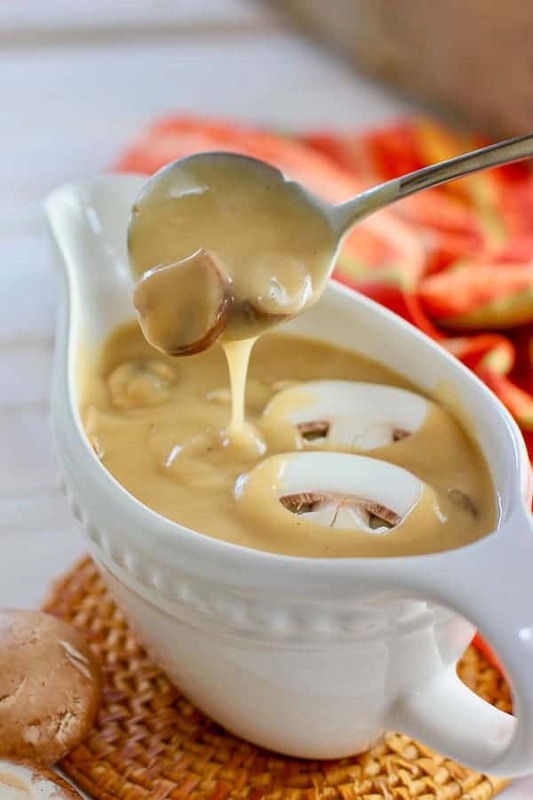 This will add some rich flavor and color to your gravy. Add your stock and cook for a bout 5 minutes until thickened. Once it starts to boil, you are done. It is as thick as it’s going to get…you have reached gravy perfection! I like to strain the gravy to remove the onions and garlic which can make your gravy look lumpy. You can omit this step if you like lumps…its okay! Let cool and store in an airtight container for up to 3 days. I tested this so I know it works! To increase the recipe, simply hover over the ‘servings’ in the recipe card. A little slider will pop up and you can adjust the recipe easily..I love food technology! This would be really great with cooked sausage as well. You can also add 1/3 cup heavy cream if desired! 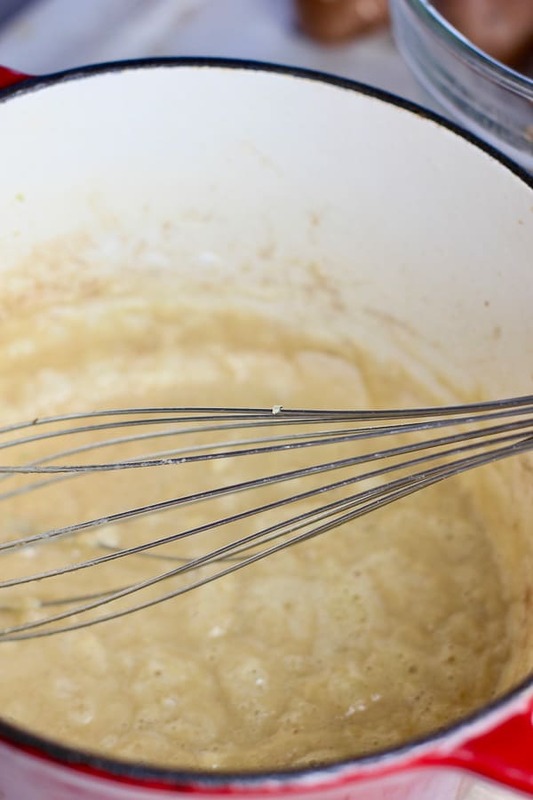 The trick to a perfectly thick gravy is this equation: 1/2 cup butter to 1/2 cup flour for the roux, plus 4 cups of liquid. It will get you the perfect consistency every time. 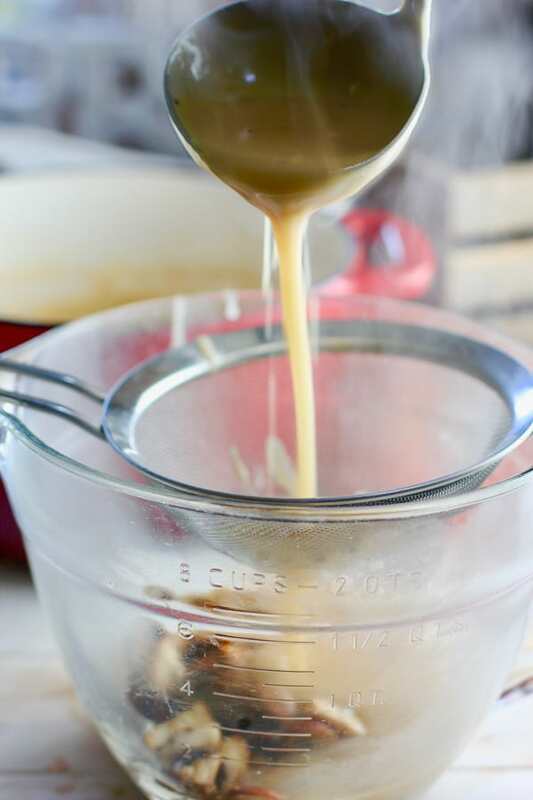 15 minutes is all it takes to whip up this incredibly easy gravy! Use turkey drippings or chicken and beef stock. You will be so glad you made this in advance! Heat large sauce pan or dutch oven over medium high heat. Add olive oil onions and sliced mushrooms. Saute until the mushrooms have reached a nice rich color. Add garlic and continue to cook for 1-2 minutes. Remove to bowl and set aside. Into the same pan, melt butter. Add the flour and cook until thick and bubbly and slightly brown in color. About 4-5 minutes. Add chicken and beef stock to flour mixture continuing to whisk. Cook for about 5 minutes until thick. TASTE FOR SEASONING, more salt, more pepper? This can vary based on the sodium content of your stock. Strain over a mesh colander to remove the onions and garlic pieces (if desired). Add mushrooms to the gravy along with the sage. Serve warm or store in a container for up to 3 days. Heat on stove top or in microwave before serving. Use a blend of chicken and beef stock to make a richer gravy. Substitute 4 cups turkey stock if you are making on the same day as the turkey. Cook the roux until lightly browned. Strain to remove the onion and garlic bits for a smoother gravy. Add cooked sausage and/or 1/3 cup of heavy cream if desired. Why do I have lumps of dough after I added flour and water to pan? Hi Tricia, you need to combine the water and flour until smooth before adding to the hot gravy. No worries, just use a wire whisk and you should be able to smooth most of it out. If not, lumpy gravy tastes just like non-lumpy gravy :). This happened to me also. My flour and water was smooth before adding and it still lumped up. Whisked it to no end and still had lumps. I think lumps of flour is nasty so I fished out as many mushrooms as I could and blended the rest. Hi April – Gosh, Im not sure how you can have flour lumps if the flour and liquid that you are adding are smooth. I don’t think flour can ‘re lump’ after being combined smoothly. I just made this the other night and noticed the garlic looked like flour lumps. Could that have been it? Sorry it didn’t work for you! Confused on this one! This looks so delicious and lovely that you can make it ahead! What a great recipe. As if it’s not enough to have gravy, a make-ahead gravy is even better! That made me laugh! Thanks for your note! Wow, such an awesome recipe! I’ve been looking for something similar to this and I’ll have to give it a try. It seems easy enough to make and uses just few ingredients, love it! 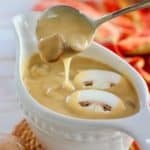 I would use veggie broth with a maybe a little tamari, but that gravy looks so good, I would probably eat it like soup!! I think veggie broth would be great! Seems to me I saw mushroom stock at Whole Foods….probably 10 bucks a can 🙂 But it would be good! Thanks for your note! I think making a good sauce is most underrated. 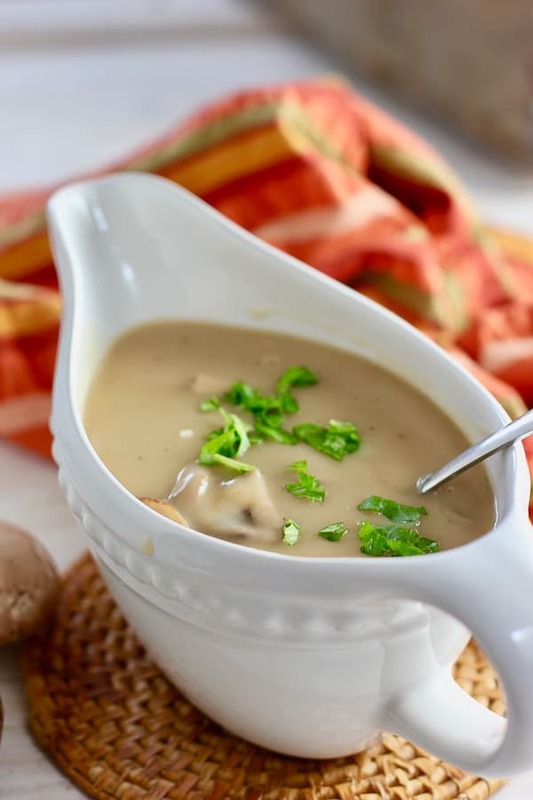 This mushroom sauce looks divine and will finish off any good meal. Nice recipe. Thanks for your note Mark! We are the Kings of condiments around here and love our sauce! I’m all for make ahead recipes once the ingredients are fresh, and these could all be. There’s nothing worse than being stuff in the kitchen when your family and guests are having a good time without you. I hear ya! And quite frankly, I don’t make the best gravy with drippings. This is made with store bought broth so a lot less effort but the caramelized mushrooms and onion kick it up a notch! Thanks for the note! Simple and delicious. Love everything about this gravy. Thanks AiPing! Hope you get a chance to give it a try!